9. Locally Sourced – We know the local environment and we have worked with and maintained relationships with production companies just like ours across the country. So if you need ASL Productions in south Florida or ASL in Seattle or LA, or Chicago we know where to turn so you can get results just like you get with us in the New York City area. And if you need us to fly out to oversee your project, we’re good with that as well and we still use our local support staff to save you money while delivering quality results. 10. The Go-To Place for National Sourcing Companies – We work for over five different companies across the U.S who calls us to handle their shoots. We are their go to source in the New York/New jersey/ Tri-State area. Our production company clients understand that we have a network full of professionals, that we’re responsible, we’re on time and we find solutions to get results. They also know they can call us with a variety of requests, from 1 hour CEO interviews, to five day celebrity art installation recap videos (Yeah, that was last week). They know that if they just need a gaffer or an AC, or if they need a director and DP and or whatever they need, we’ll have their answer quickly and effectively. And now you know this as well! 11. Preparation – We know what to look out for and the pre production solutions to ensure a smooth shoot day. Let’s take one example, location scouting: You not only need to know where to point the camera in your scene, you need to know where you can store all your equipment cases out of the way, where the hair and makeup team can setup. What is the lighting situation? Is daylight coming in through windows? What is the color temperature of the bulbs on the ceiling? What is the power situation, can I plug two Fresnel lights into that outlet? What is the audio situation? Is it okay to ask the people around to be quiet or is it important not to disturb their regular work environment? 12. The Network Stronger Than Any Other – We’ve covered a lot of ground here, but what mostly separates us from the rest, is our network. Accomplished commercial DP to up and coming NYU videographer, we know the names and know who can deliver your vision on time, on budget and while having some fun along the way. Our network extends from camera department to lighting to audio and well beyond. We never say no to our clients because we know our network is so strong that if we don’t have the answer, they do. When you go to ASL Productions, you’re joining a team with over 12 years of video content experience with relationships from New York City to Juneau, Alaska, with a production company that will do everything in their power for their clients to get results. 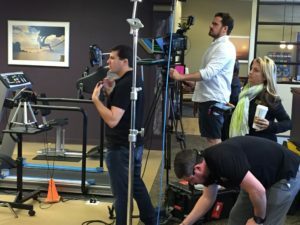 This was the third part in our three part series on the twelve reasons ASL Productions is your go to place for corporate video production. Whatever the question or query, never hesitate to reach out to our team. From a question about lighting to a quote for a project, we are just a phone call or email away. A special thanks to our sponsors.